I came across this sighting report by Tom Rose from news.gather.com. He wrote about a UFO, or a pair of UFOs that were caught on video over the nighttime skies of Bogotá, Columbia. He asked that question, "What is it?" He wrote, "The unidentified flying object is notable because of the quality of the camera being used to capture the image. 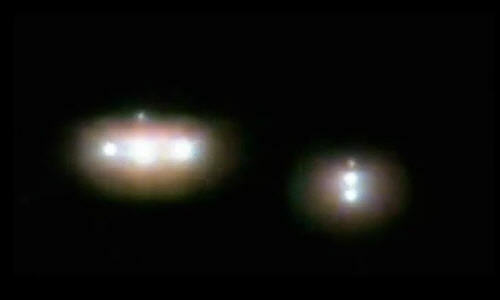 What seems to be a distant pair of lights is zoomed in on, revealing the classic shape of the circular UFO with pulsating lights, brightly illuminating the sky." He added that, "The videographer makes no comment as the tape is rolling, choosing to let the camera tell the story. It's impossible to pin down the area of Columbia, but it's obvious the object is flying over a town or village, with some traffic noise in the background." Read the entire article: http://news.gather.com.